Chocolate Japanese on left out of Peaches and a Chocolate Magpie on the right out of Peek. Harlequins are also one of my favorite breeds of rabbits. I love their colors and patterns, their excellent mothering ability, and sweet, friendly dispositions. I have both varietes of Harlequins - the Magpies and Japanes, in all 4 colors (Black, Blue, Chocolate, and Lilac.) I just feel in love with them when I saw them on a friend's website, and just had to get me some! I was able to get my 1st ones (2 Blue Magpie does) in the Spring of 2010, and have been in love with them every since! I have been able to ad bloodlines from several breeders across the country, and my herd has grown quite a bit, and I have some pretty nice rabbits in my herd now. I just love them!! and they come in 4 colors - Blacks, Blues, Chocolats, and Lilacs. Sr. Does (6 mos. of age and over) - 7 -9 1/2 lbs. Ideal - 8 lbs. Jr. Bucks (under 6 mos. of age) - not over 7 1/2 lbs. Minimum weight - 3 3/4 lbs. Jr. Does (under 6 mos. of age) - not over 8 lbs. Minimum weight - 3 3/4 lbs. Head, ears and body should be well proportioned and gracefully carried. Ears are to be carried in a "V". The width of the hindquarters should be slightly wider than the width of the shoulders. The top line should begin at the nape of the neck, gradually rising to a high point over the hindquarter, then gently slope to the tail. Bone is to be medium. Faults - Excessive dewlap; massive or wedged shaped head; short body; short ears. Flyback type fur. To conform to the ARBA Commercial Normal Fur Standard. All colors are to be as rich and dense as possible. No one color is to take preference over the another. In the Japanese group, Fawn is a dilute of Orange, and occurs in conjunction with dilute marking colors of Blue and Lilac. Clarity is defined as that is distinct. Alternating colors should be clean and not mixed. The pattern over the back may be banded, barred, or a combination of both, without preference. Clean lines are to be stressed, with alternating Black and Orange. The ideal body marking will have 5-7 alternations of bands and/or bars on each side, beginning with the chest. The Chest should be evenly divided with the Black 1/2 chest and leg under the Orange 1/2 face, and the Orange 1/2 chest and leg under the Black 1/2 face, thereby framing the face with it's alternating color. Definitions - A band is considered an unbroken circle of marking color. A Bar is a semi-circle of marking color, running vertically on the side. 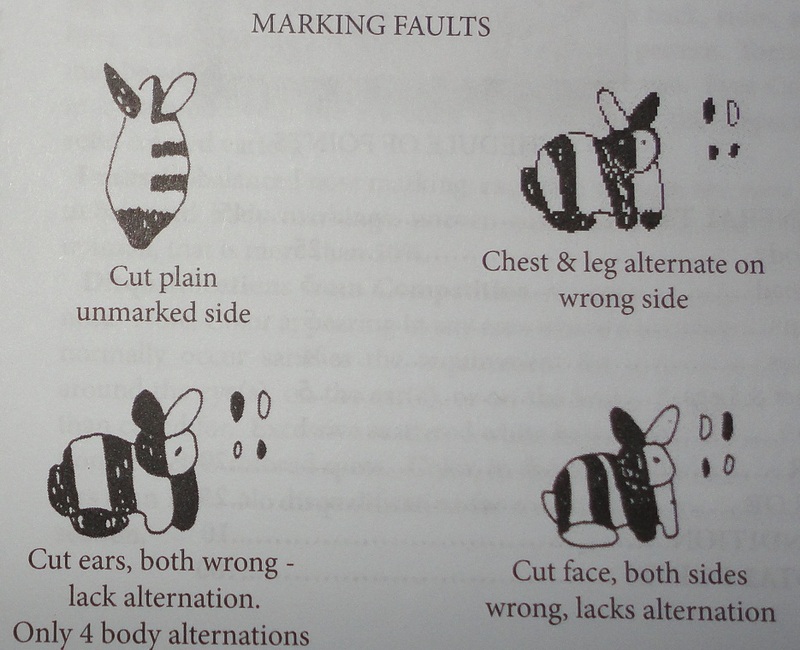 Faults - Excessive Brindling in a marking or body color. Poor balance of sides due to plain unmarked side. Disqualifications - Disqualify for body marking resembling a Dutch Belt and saddle marking. The head is to be divided equally, one side black, the other orange. 5 points are allotted for each side of the head. One ear is to be Black, the other to be Orange (one solid color from tip to base.) The Black ear is to be on the Orange side of the face, and the Orange ear is to be on the Black side of the face. 5 Points are allotted for each ear. Faults - Short, incompleate demarcation or parting line; ears of the same color; ears which fail to alternate with the head markings, or head markings that fail to alternate in color with the ears. Disqualifications - Failure to show a clearly discernable parting line down the center of the face, mostly Black on 1 side and mostly Orange on the other. One front leg is to be Black, and the other Orange. One hind leg is to be Black, the other Orange, reversing with the forelegs. (all 4 legs alternating colors from left to right.) Toenails in Japanese group may be light, dark, or mixmatched. Toenails in Magpie group may be white, dark, or mismatched. Disqualifications - White toenails in Japanese. Pic taken from the ARBA Standard Of Perfection book for reference. Pic taken from the ARBA's Standard of Perfection book for reference. http://www.americanharlequinrabbitclub.net/Home_Page.php - American Harlequin Rabbit Club. http://sites.google.com/site/southerquins/ - Southerquins - A Southern States Harlequin Rabbit Breeder Club. http://harlequinrabbitcluboftexas.webs.com/ - Harlequin Rabbit Club of Texas.